- AVAILABLE IN LADIES REGULAR, TALL, AND PETITE LENGTHS. The Suggested Retail Price for this item is $259.95 ...Your price is MUCH BETTER!! These Irons were "MODELED" after the popular CALLAWAY VFT SERIES (and the best part is that you can actually AFFORD to play them at this fine price)!! (Lofts: 27-30-34-38-42 and 47 degree Pitching Wedge. This FULL set of irons from AGXGOLF is a full technology package!! These Irons were inspired by the very popular CALLAWAY HAWKEYE SERIES Irons and are real "Shot Makers" or should we say "shot savers"! The Oversize17-4 Grade Stainless Steel heads with the the Cavity Back, Perimeter weighted golf club head design (like the "Callaway Series") makes it much easier to hit a nice HIGH STRAIGHT shot while still allowing you to "work" or "shape" your shots!! This club head design technology, plus the superior "APOLLO" Stainless Steel Shaft Technology produces a club with awesome distance that's easy to swing. "I started playing these irons and I cannot believe how much better I'm hitting the ball". Having TALL GOLF CLUBS means getting better distance with a more relaxed swing and THAT FEELS GOOD!! Although these sets are intended for medium to lower handicap golfers, beginners who don't mind starting out with an advanced set will find that these golf clubs are easy to learn with! Keep in mind that the Stainless Steel heads have OUTSTANDING durability. So even if you are a beginner or you are up-grading from a beginners set, you can expect these clubs to last you a lifetime of golf. These sets were built right here in our Highland Michigan facility, they are fully assembled and ready to play!! We hope you enjoy playing these fine sets as much as we enjoyed crafting them!! 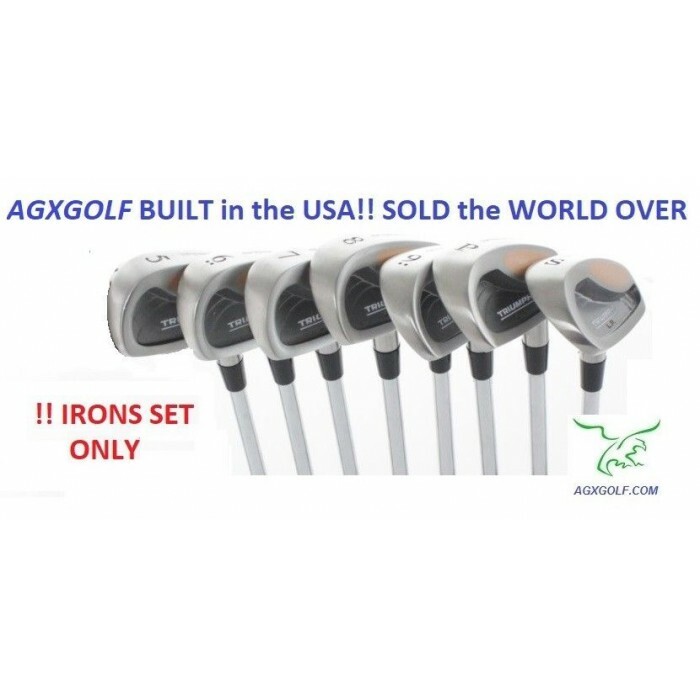 So if you are looking for Pro-Line quality, Over-Sized Irons, but not an "OVER-SIZED" price tag, then we think you will be very happy with this set! !